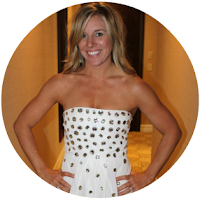 Sweat and Sequins: I LOVE EASTER! So it is almost here!! MY FIRST DRESS FITTING!!! I am so excited! I am going home on Saturday morning with a great friend and bridesmaid, Kate, to see my dress and pray that all goes well! My mom is coming as well as a couple other bridesmaids! I will def. keep you posted on how that goes. I found these wedding shoes that I LOVE! They were in the new issue of BRIDES magazine last night! Not sure Dave was too thrilled about the price tag....I am sure I can find them on sale somewhere! Rue La La has sales on Bagley Mishka all the time! I can't decide if I like Black or White....Big Surprise! 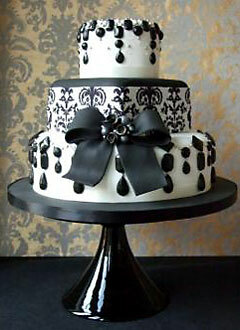 I really want to make this cake! My mom made me one when I was little and I just loved it! I have always wanted to make another one! Maybe a great thing for Sunday Afternoon!! LEAVE 1 cake whole. Use serrated knife to cut remaining cake into 3 pieces as shown in diagram. (See Tip.) 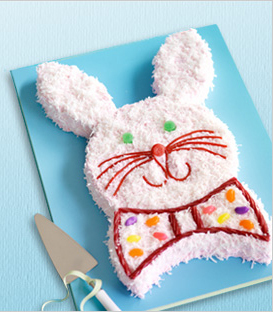 Arrange on large foil-covered board or platter to resemble a bunny’s head and bow tie, using small amount of COOL WHIP to attach pieces to each other. FROST cake with remaining COOL WHIP. SPRINKLE with coconut. Decorate with remaining ingredients as shown in photo. Keep refrigerated. Speaking of Cake, Dave and I really need to decide what we are going to do! Here are a few cake ideas that I like for the wedding! I love this but not with the flowers!! 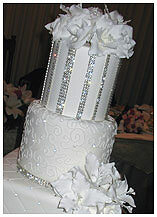 I really just want an all white cake but I had to put this on here because it is so "Sloane"
Ok that is all for now!! Hope you have a wonderful Easter! 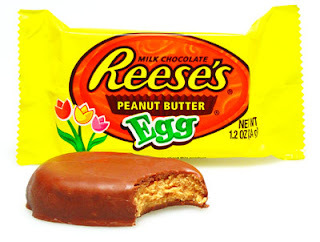 Make sure to remember the real meaning of Easter...not just for the Bunny...or the Robin Eggs! HUGE AWESOME NEWS!!! and lots of RANDOM info! Sites I Visit WAY TOO OFTEN!